The members of Bacon Ipsum stared in growing horror at the flames consuming Moscone. Datatello’s concern heightened with each area he recognized, but his eyes focused on his own neighborhood, wondering if his sister, Erikuhl, was safe. Bakaryu had to use all of her mental discipline to stay put, seeing the glow and smoke from the Temple district. He approached the prone, metal dwarf and leaned down to inspect. To Trailblazer’s horror, two needles rose from his chest and struck Dirk in the hand. Her years of surviving in the wilderness made it clear that this was poison, but no matter her abilities, she couldn’t pinpoint it. Datatello had already hopped onto his magical, rolling board and was heading toward his home, the others following. Erikuhl, his sister, was waiting, waving frantically when she recognized him. He looked down to see a pair of bracers and a necklace, a kind of upside down triangle with something carved into it. He had barely any time to don them, for lack of a place to put them otherwise at least, before three dwarves, large and covered in metal like the one Master of Coffee, turned in unison and began stalking toward them. Things swiftly fell to chaos. Coming up swiftly behind Datatello, Kriv summoned fire and hurled it at the oncoming monstrosities. Either unprepared or unconcerned, the dwarves seemed to simply walk into the new flames. Bakaryu sprinted forward, first to ensure that neither Datatello nor Erikuhl were similarly engulfed in flame, and to open her maw and breathe a rolling ball of energy onto their attackers. One of the weighted spheres flew directly at the dwarf closest to him, knocking into its head. It turned to stare quietly at him, and the half-orc moved closer to attack, punching him in his jaw. The dwarf had no reaction, but there was a definite sting in his own hand. Trailblazer, astride Cloudy, came up behind the party. She took aim with her bow, the goat’s added height making it possible for her to use her longbow. The arrow shot out, whistling through the air to bury itself in the eye of the dwarf Datatello had just angered. In the time that it flew, she drew another arrow. Before it cleared Cloudy’s head, the goat twisted and caught the arrow, chewing on the wood thoughtfully. Trailblazer stared at her, feeling betrayed. Arrow still in its eye, the dwarf still stared at Datatello, its hand starting to shudder, opening and closing with a strange regularity, as if on a spring. The dwarf behind it, prone, lifted back to standing, like a fulcrum. Once straight again, he reached behind, drawing a battle-ax from its back. The axe grew, extending both the handle and its blades – blades that started to spin wildly. The dwarf took a step and swung the spiraling blade at Datatello, slashing into the half-orc hard enough that the monk stepped back, inadvertently dodging the second blow. The third dwarf standing near Bakaryu held up his arm, his hand popping down, as if on a hinge, and a circular blade came out, spinning menacingly. Before he lunged, he turned, seeing Trailblazer. He turned and started toward her. Kriv’s eyes narrowed, seeing the change in direction, and lashed out, a blast of electricity arcing through the air toward their attackers. All but the potential leader, wielding the battle-ax, seized suddenly, then fell unceremoniously to the ground. The leader turned toward his attacker and began stalking toward Trailblazer, a well. Bakaryu acted immediately, stepping in front of him and driving forward with her sword. The dwarf looked at the sword, taking a step forward, still staring at Trailblazer. And he fell slack on the blade. The others looked at him, but he went peacefully into a meditation. He twirled then brought his quarterstaff down, shouting his holy cry, feeling his body start to heal. “Maybe you should ask if the wizard has a health potion,” Kriv offered helpfully, frowning when his cloak came into view. The corner snapped him in the face. “It was a genuine ask,” he grumbled. The corner snapped him the other way. Bakaryu, realizing that her companion was still injured approached, reaching out to offer him healing. The wizard sighed, “It’s not as useful if we don’t have water.” He gestured, as he spoke, a tube started falling out of his robe, and with each gesture, more fell out. She grabbed the tube coming out of Kriv’s cloak and began to run, pulling it. It continued to flow until, finally, the end popped out. “We need a water source,” Kriv sighed. Datatello made his way to a nearby entry to the aqueduct below them, while Kriv’s cloak dropped another hose out, as if annoyed. They connected the hoses and, after some additional work and questions, they had a pump to bring water out of the sewer and toward the fire. A little over halfway there, they came across a dwarf sprawled on the ground, black, spiderwebbed marks on his face, as he struggled to breathe. 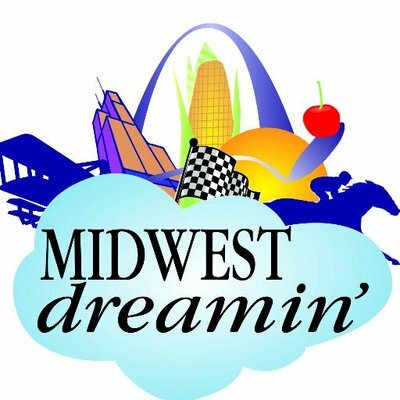 Datatello called Trailblazer over, and she approached, recognizing him immediately as Wuric, a traveling merchant who had the displeasure of being in town. The dragonborn approached, holding her holy symbol in her hand and kneeling. She channeled the power of the storm through her, focusing it and shaping it, as she reached down to place her hands on his chest. Before Trailblazer could shout, to warn her, two needles whipped out, just as they had in the Master of Coffee, but they stopped, evaporating. The black lines on Wuric’s face began to recede; his breathing returned, even and steady, and finally the only indication of his previous condition were two pinpricks on his cheek. “Dwarves. Some dwarves attacked,” he muttered, sitting slowly, “focused on dwarves, but they attacked everything. I fend them off as best I could, but something got me with some poison, I guess. I couldn’t do anything. I felt my mind retreating, like I was losing grip of it, like I was being pushed to the back. And there was…this voice. So loud. It just said…all things must be dwarf,” he finished, shaking his head. As her companions spoke, Bakaryu concentrated on the poison that she had just cleansed. It felt…like power of the undead. Her sense of the divine made it clear, the clawing sense of evil dissipating, along with the poison in the dwarf before her. “Were the dwarves strange looking?” Trailblazer asked, rubbing her face. In answer, Wuric began gingerly removing chainmail, asking her for help. 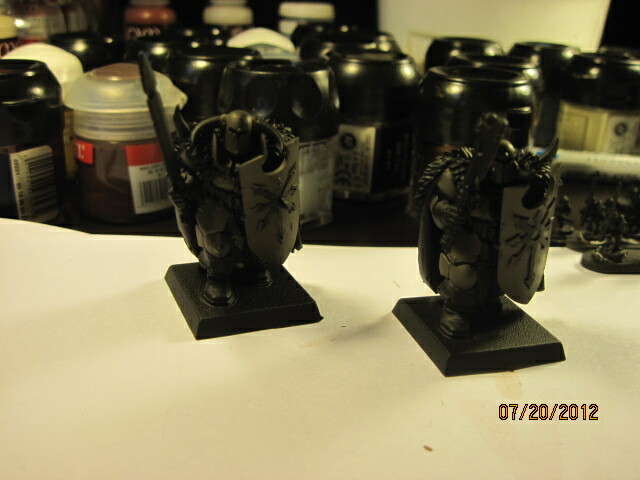 While the black had receded, there was already metal plating across his chest. She nearly recoiled but steeled herself, leaning forward. It looked like iron. The aura itself was faint, and growing fainter, but it was there. “When did this start?” Trailblazer asked. No one said anything, and Trailblazer looked bemused. Datatello scaled a building, feeling that he needed to watch for any further bad news. The fires seemed to have died down, or at least not spread, much to his relief. As he scanned, he saw pockets of dwarves, all heading in the same direction – not speaking, not showing signs of camaraderie, simply…marching. As the dwarf retreated into the distance, Trailblazer turned back to the party, “So let’s get you to your temple,” she grinned at Bakaryu. They were close, so it wasn’t long before they entered the courtyard of the temple district, all centered on the towering statue of a flower, multi-colored with the stones and metals that made it. Many of the temples were untouched, but damage had been done to both the Temple of the Maker and Temple of the Storm. Puddles of water surrounded them, clearly the work of magic. The Temple of the Maker was razed to the ground. Bakaryu approached the Temple of the Storm, where Longshore, a bronze dragonborn that she knew through the temple was finishing some work. “You made it, Ryu,” she breathed. “Restoration,” she shrugged, unsure how else to explain it. The other party members turned to look in the direction, trying to determine what they could be headed toward. No one could put their finger on what they could be headed toward – it seemed innocuous. But they knew, at least, that that was the direction they needed to head in. A little back story: Eric and I were up North last weekend visiting some of his friends, and we spent Sunday morning/afternoon in a game store playing Warhammer 40K. While there, we picked up some Valejo paints for historical miniatures, specifically some German WWII colors. We’ve been slowly switching from Citadel paints (made by Games Workshop) to Valejo because the Citadel paints dry out too quickly. 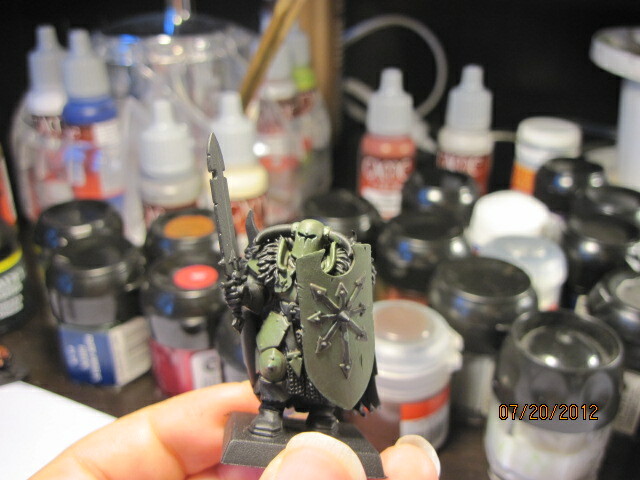 With these new paints in hand, a new unit of Chaos Warriors to paint for my Warhammer army, I decided to try some of the drab green colors and paint the unit devoted to Nurgle. 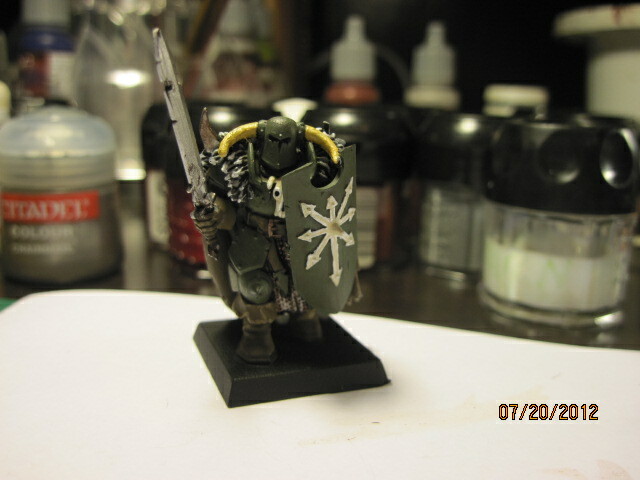 The Valejo paints dry a lot flatter than the Citadel paints, so the color is subtle. I actually preferred that for what I was doing. 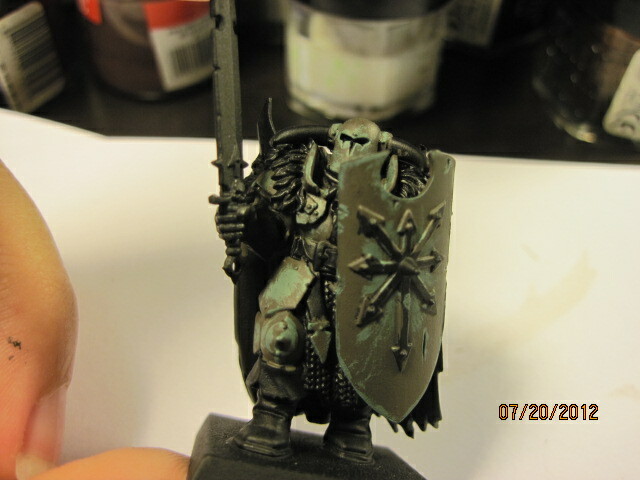 I dry brushed and highlighted the armor (and shield) with German Green, which is obviously much lighter. I didn’t like how light it was when I first tried this, but the solution was easy, and this two-tone under coat makes the final color a little more realistic. Catachan is a Citadel paint, but that’s alright. 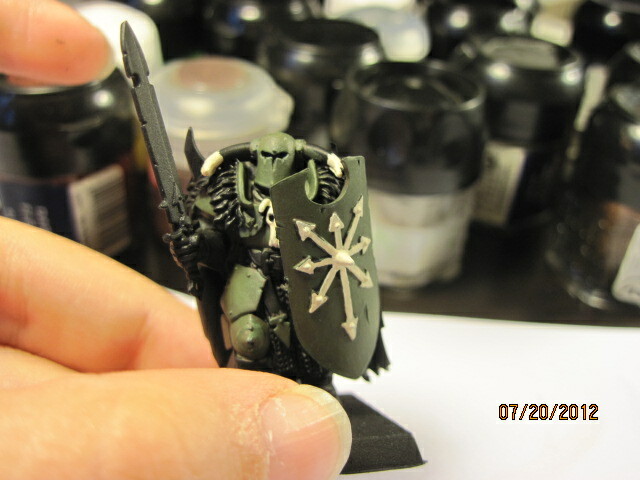 It’s hard to see in the picture, but with the lighter green against the olive, there are natural highlights now. 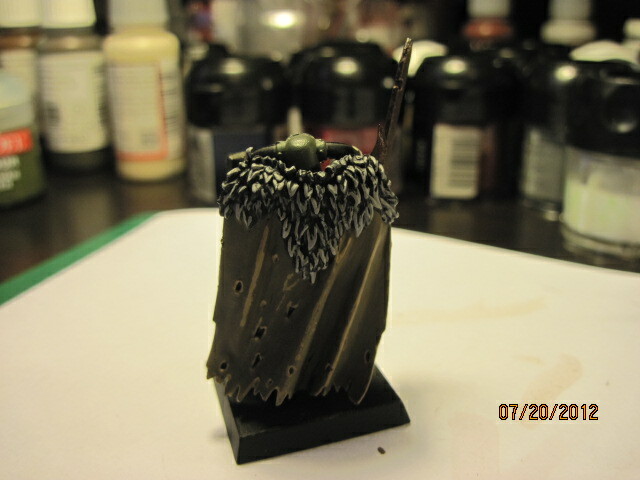 For the cape and leather bits, I used Valejo’s chocolate brown, another flat color. Then I highlighted. 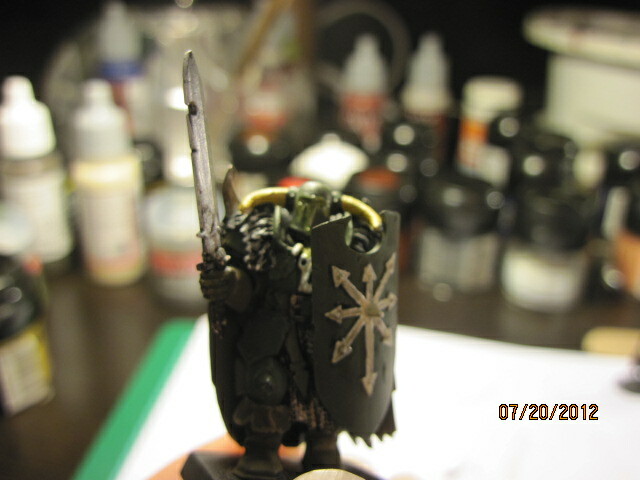 The final touches were some white tips on the fur of his cape, the highlights on the sword, shield, and leather bits. And then I painted the puss coming out of his helmet. It’s sufficiently gross. All together, the two that I finished yesterday were some of the best I’ve painted. As it turns out, having the right kind of paint is a real help. They took a combined 2.5 – 3 hours. Only 10 more to go, too. Oh boy. Went to see The Amazing Spiderman today, which was fantastic. I have to be honest; we were planning on going to see that this weekend anyway, then waiting for the crowds to thin for Batman, but after what happened in Aurora, I don’t know…it’s all very surreal. I also gathered all of the supplies for birthday gifts! I will post those as I finish them (blanket, pillow, curtains).